Customer trust is a complex topic. With it we can do wonders. Without it… well, it’s unlikely we’ll have as many customers as we might like. The world is changing. Some people are consuming more consciously. Technology continues to evolve rapidly. We’re generating more and more data, particularly about human beings. With this comes a variety of risks, many of which are well documented. There’s also a proliferation of information, both evidence and opinion-based, that we as everyday people have access to. Social media makes sure of that. Knowing who to trust and why has become a tough equation. But this article isn’t about interpersonal trust—apparently that’s decided in a matter of milliseconds anyway. This article is about the data trust gap and how to close it with design. Let’s start with some working definitions I’ve developed. The firm belief in the reliability, truth, or ability of an organization. This is a measure many organizations and their research firms have become quite familiar with. 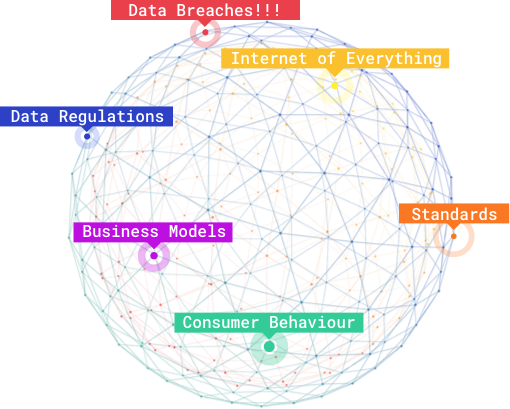 But what is data trust? The firm belief in the reliability, truth, or ability of an organization’s data practices. Intuitively you might think these measures are the same, or at least they should be. Research shows that in the eyes of the people organizations serve as customers, patients, or citizens, these measures are not the same. The trust people associate with a brand tends to be much higher than the trust they associate with a brand’s data practices. 78% of people state it’s hard to trust companies with their data. Given the data-driven nature of our economy and society, it’s my belief these metrics should be one in the same. Data is inherent to the relationship between brand and customer. It fuels insight, grants access, gives context, and, most importantly, plays a vital role in helping fulfill real life human outcomes—the things people, our customers, really care about. 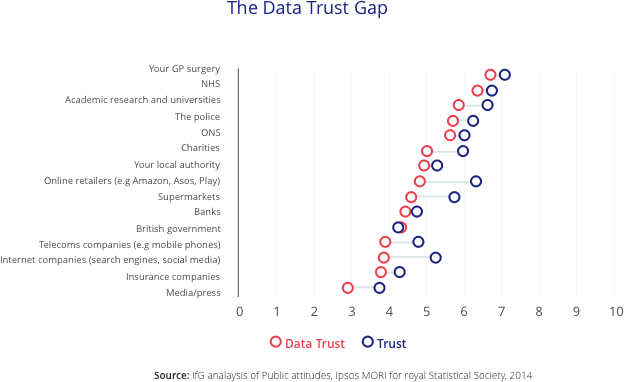 We need to close the trust gap if we are to use data in new, unique, and empowering ways. We can achieve this with design. Research from Cognizant in 2016 gave us insights into the factors that impact data trust. At the top of their list was data transparency. This aligns to my experience. It also aligns to Rule #2 of designing with personal data. You can learn more about the 3 rules of designing with data here. So what exactly is data transparency? I’ve searched for definitions. Unfortunately nothing I found captured the essence or power of data transparency in the context of designing for trust. So I crafted a working definition. Succinctly communicating what data you intend to use, along with when, how, where, why, and with whom you intend to use it, so the people you serve as customers are informed, empowered, and capable of making a choice. Data transparency tactics are therefore the different contextual mechanisms you use to inform and empower your customers. More on that soon. If we break the working definition down, there are 2 core elements. The first relates to the contents and style of communication. The second relates to the objective of the communication, or the desired customer outcome. The latter is of course a variable you cannot fully control. 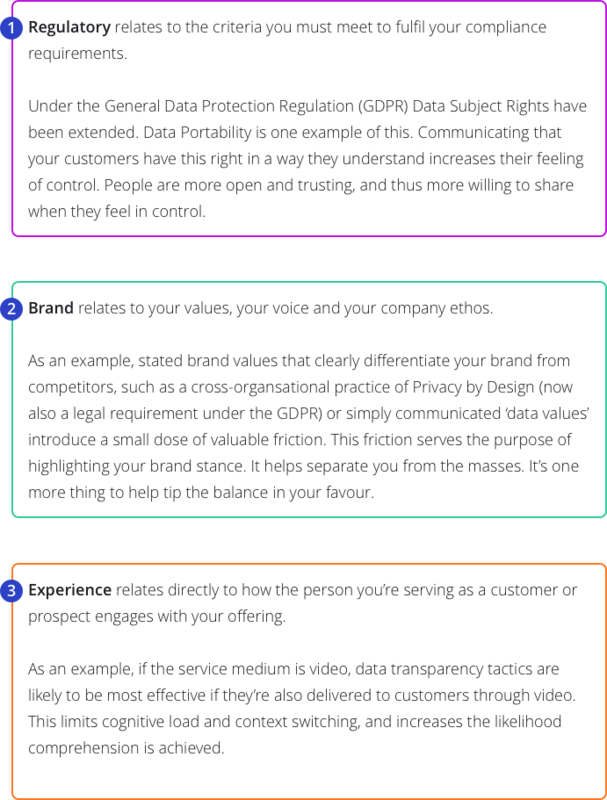 Effective data transparency in practice balances regulatory requirements with brand values and a contextual experience that complements, rather than hinders, a person’s experience. However, most brand experiences today are cumbersome. They’re confusing. They rely on legalese, and they’re rarely designed in context or collaboratively with the type of people the brand serves as customers. The data trust gap exists because of this dynamic. Today our experiences are far from transparent. To move beyond this, we need to get closer to the people we serve as customers. The notion of Know Your Customer (KYC) is well understood by many organizations. KYC has a role to play in a variety of contexts. But rather than focusing on regulatory requirements, Know Your Customer in this context is about developing an intimate understanding of the things people are trying to achieve. Once you understand this, you’re best placed to serve and deliver unique value. Below is a quick summary of the process you can follow to Know Your Customer better than ever before. Start by using job mapping or a similar process to uncover and succinctly document the Jobs to be Done of the people you intend to serve as customers. This will give you an intimate understanding of what people are trying to achieve, why, how much they care, what success looks like, and also what’s standing in their way today. You can use the template below as a resource to help you get started. From this basis you’ll be in a strong position to identify opportunities to serve these people more effectively. Once you’ve uncovered customers’ jobs and prioritized them based on strategic alignment, importance, and satisfaction, you want to learn about the factors that influence someone’s motivation to switch. You want to know what you might be able to do to create more value, remove ambiguity, and assist someone in switching towards your product or service. You want to help them change their behavior for the better. The switching formula can help. It’s important you focus on this moment because people overvalue what they currently have. It’s also likely you overvalue what you currently offer the market. 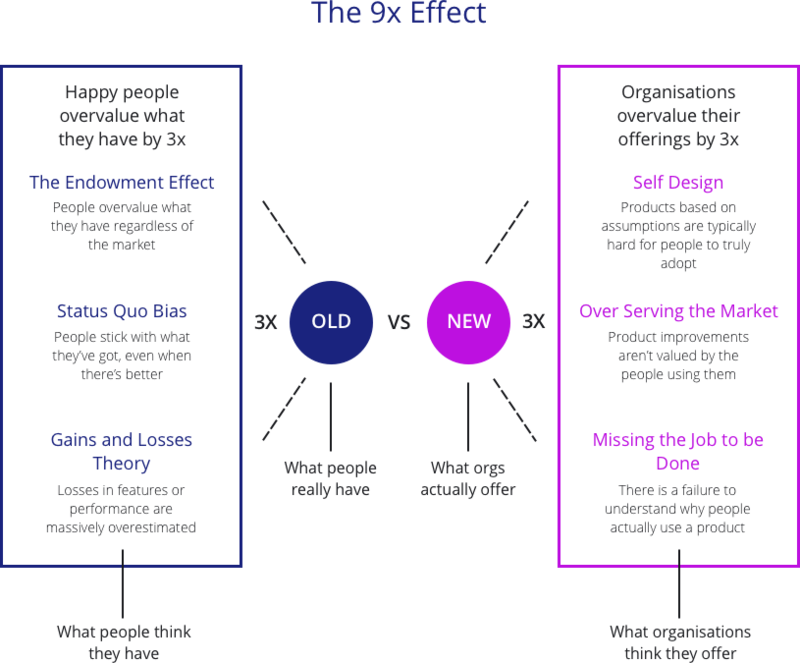 This is often referred to as the 9x Effect. What this means is you have to design something with perceived 10x appeal if people are to make the switch in your direction. Knowing Your Customer gives you the best possible chance to realize this 10x effect. Once you’ve executed your KYC process, you’ll be ready to embed these insights into an evolved design practice. This practice will help you use data transparency to earn trust and create competitive advantage. When it comes to Data Transparency by Design, best practice is yet to emerge. The market is still trying to figure things out, particularly in Europe thanks to the General Data Protection Regulation. My observation is that organizations who learn fastest are making the most progress. These organizations are using their own flavor of Data Transparency by Design to test and prove what works for them—prior to taking these new tactics to market. Other than factoring the Regulatory, Brand, and Experience criteria from above into design efforts, I’ve recently observed Data Transparency Experience Mapping and Data Transparency Design Experiments in practice. Data Transparency Experience Mapping is a focused customer research effort. 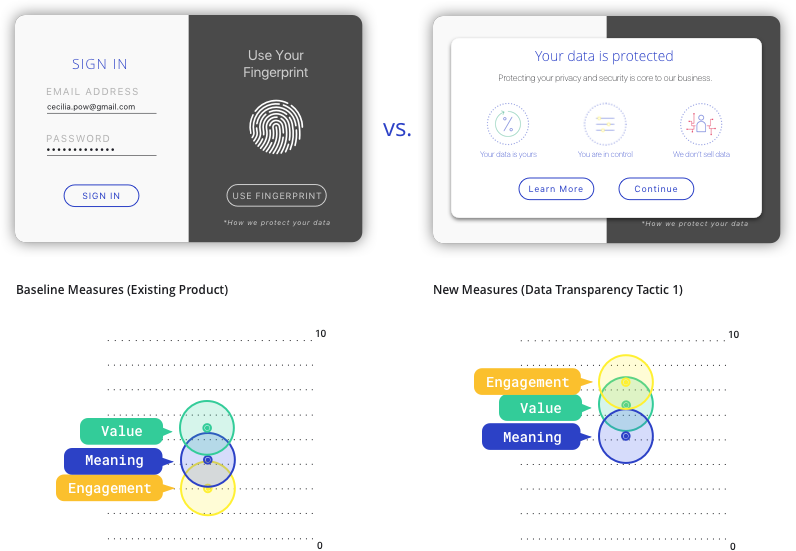 It draws inspiration from existing experience design tools and practice, yet focuses specifically on the impact data transparency tactics have on a person’s experience with a product, service, or brand interaction. Data Transparency Design Experiments put hypotheses to the test. They isolate specific variables so the impact of data transparency tactics can be quantified quickly and effectively. The data from these experiments informs what is designed, for whom and why. Regardless of your Data Transparency by Design “flavor,” if you remember one thing, remember this: data transparency has to be designed. It can no longer be an afterthought. The organizations that earn trust and effectively close the data trust gap will be those who evolve their design process quickly. Having said that, there’s something massive we’ve missed. Without it, we won’t make much progress. This is a prerequisite. Data Transparency by Design shouldn’t start with design process, tactics, or experiments—it should start with strategy and stated brand values. These brand values will face internally and externally. They’ll inform how quickly and effectively data transparency finds its way into your workflows and the lives of the people you serve as customers. If data transparency is part of your brand, you’ll begin earning data trust. Data trust is a competitive advantage. It can be the foundation from which you create new customer and business value. Ultimately, this is what we’re all working towards. *Part of this article has been extracted from an upcoming publication, Designing for Trust: The Data Transparency Playbook. This publication is written by >X and supported by the Data Transparency Lab. It will be released in late September.